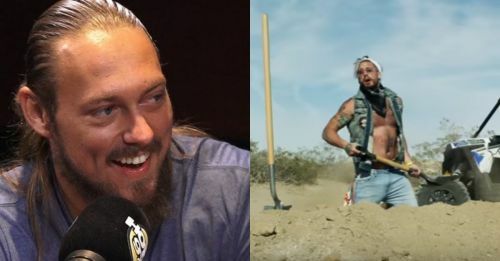 5 Recently Released WWE Stars: Where are they now? WWE can be one ruthless place. Not every pro wrestler who aspires to become a ‘top Superstar’ does end up living the dream as many get buried into obscurity. They are served as fodder to main event talents and find themselves struggling for relevancy in the lower mid-card until they eventually get released. Now, there is one thing about being talented and not getting pushed enough and there is the other side wherein you may just not be well-rounded enough to make it big in the WWE. In both cases, you will end up being shown the door or you may just find that door yourself. Then you have the careless bunch that has the knack of landing into trouble. As we all know, WWE has adopted a zero-tolerance policy and even the faintest of blots on their public image would lead to an unceremonious release, in less serious cases, a light suspension. There is no job security in the WWE unless you’re that dude whose name rhymes with grains. So what, if he didn't win any in WWE, Aries made up for as soon as he left! We know; it’s been a while since the greatest man that ever lived left the biggest pro wrestling promotion in the world but you have to know how well he’s doing since being freed from the criminal underutilization courtesy of WWE’s creative team. The Impact Wrestling faithful would be familiar but for those who aren’t, A Double is the current Impact World Champion (his 3rd reign) and has been so for quite some time now. After rehabbing and working out in the WWE performance Center itself during his 90-day non-compete clause with WWE, Aries predictably returned to Impact and won the title on April 24th, 2018 and has held the strap for 129+ days while also being the Grand Champion at the same time. However, Aries merged the two titles, thus effectively retiring the useless Grand Championship for good. He is also the current Heavyweight Champion for Australian promotion World Series Wrestling. The flexibility of his contract enables him to actively compete in the independent circuit. He even defended the Impact World title at a House of Glory show in August and also made a return to Ring of Honor during the promotion’s 16th anniversary show. Aries may not have been a popular figure backstage in the WWE, especially amongst the writers and staff, but he is certainly a big draw in the indies and is doing a darn good job of restoring some legitimacy to TNA. 5 WWE Superstars who retired recently: Where are they now? 5 former WWE Attitude Era Superstars - where are they now? The Corporation: Where are they now? The first episode of WWE SmackDown Roster: Where are they now?